FILE - A lunch is served in a New York City soup kitchen. The White House released a report Thursday contending that the United States' war on poverty — a drive that started over 50 years ago to improve the social safety net for the poorest citizens of the world's largest economy — is "largely over and a success," contrasting with other reports on the nation's poor. The report, authored by President Donald Trump's Council of Economic Advisers, called for federal aid recipients to be pushed toward work requirements. "The timing is ideal for expanding work requirements among non-disabled working-age adults in social welfare programs," according to the report. "Ultimately, expanded work requirements can improve the lives of current welfare recipients and at the same time respect the importance and dignity of work." The council's report contrasts with a U.N. report on poverty in the U.S. that was released last month. That report said about 12 percent of the U.S. population lives in poverty, and that the U.S. "leads the developed world in income and wealth inequality." Phillip Alston, a U.N. adviser on extreme poverty and the author of the report, wrote in December 2017 that he believed Trump and his administration, along with U.S. House Speaker Paul Ryan, a Wisconsin Republican, "will essentially shred crucial dimensions of a safety net that is already full of holes." 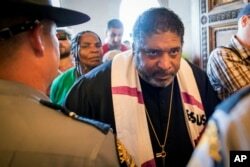 The Reverend William J. Barber argues with state troopers at the doors of the Capitol during a protest organized by the Kentucky Poor People's Campaign in Frankfort, Ky., June 4, 2018. Anti-poverty activists were denied group access to the Capitol following an outdoor rally that included a denunciation of the nation's first work requirements for Medicaid. Both programs were among those introduced in the 1960s, during the administration of then-President Lyndon Johnson, a Democrat who coined the term "war on poverty" during his first State of the Union address. The Trump administration has already permitted four states — Kentucky, Indiana, Arkansas, and New Hampshire — to implement work requirement programs for Medicaid recipients, the first such restrictions enforced on the program. In June, however, a federal judge struck down Kentucky's mandate, writing that the administration's waiver "never adequately considered whether [the program] would in fact help the state furnish medical assistance to its citizens, a central objective of Medicaid." Anne Marie Regan, a senior staff attorney for the Kentucky Equal Justice Center, one of the organizations that successfully challenged the Kentucky waiver, told VOA that while she didn't know the specifics of other states' Medicare waivers, she thought similar challenges could be successful because of the administration's insistence on work requirements. Regan said her state's proposal would have removed 95,000 people from health care coverage. "The war on poverty is certainly not over," Regan said. "There's certainly still a great need for a safety net."